Green clay for face is a perfectly natural means, after which your skin will become soft, elastic and smooth, while wrinkles will become less visible. It is important to note that the green clay mask preparation is very easy and above all its use is simple. In a few minutes you can create excellent cosmetics which primarily detoxify the skin, nourish it and give it back its necessary moisture. 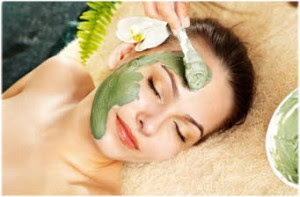 In addition, green clay is also used in the treatment of various skin diseases, burns, eczema, psoriasis, acne, boils. Learn everything in the following article. What types of clay are present? White clay (rich in silica, zinc and magnesium, prevents hair loss and strengthens cracked and weak hair), is recommended for people who have something sensitive facial skin, which is often dry and flaky. It is very gentle and will act like a baby powder on the surface of the skin, it has an extremely absorbent effect and better absorption. It is a favourite product in the pharmacy. From it you can make remarkable masks mixed with a little bit of essential oil and water, easy to apply and yields good results. Green clay (containing magnesium, calcium, manganese, phosphorus, zinc), is especially appreciated in cosmetics industry for skin care face and body. Many only use it as a mask, but it is important to say that its medicinal effect spreads to more areas that can be consumed orally. It is an excellent detoxifier, cleanses the body of all impurities deposited. If the body has any inflammatory process, green clay will successfully remove and throw out diseased cells, whether they are located in the lymph, blood or tissues. All that is bad in the body - is easy to eliminate, where every healthy cell will be supplied with additional energy. blue (contains all the minerals and trace elements that are essential to body: silicon, iron, silver, magnesium, calcium, phosphorus, zinc, aluminium and copper, and is used to disinfect the skin, soothes inflammation, improves circulation and prevents hair loss). Today we know of several different types of green clay, the most admired is the one that comes to us from the mines in France, as well as from Sicily. It can be used orally, only if it has certain certificates. Therefore, caution is necessary, and you should take care that your product has the following written on it: ventilated green clay for oral use. Otherwise, you should not drink it. Dilute a spoon full of clay (ventilated) in a glass of water (it would be best to use spring water and it should not be boiled). Avoid metal spoons and glass as green clay would not dare to get in touch with them. Beverage should be drunk immediately or waited for morning to be consumed an hour before breakfast. First week: Drink only water in the morning with green clay, do not stir the beverage and do not throw away the sediment from the bottom. Second week: The green clay is first mixed in a glass, wait five minutes for the sludge to settle and then drink it. Third Sunday: Stir it well and drink it all together without having to wait. As you can see green clay, which is drunk, is dosed carefully, gradually increasing the dose as time goes on. After 21 days of using this drink, take longer breaks. On an annual basis it can be applied up to 4 times, but not more than that. Today there are more theories and less proven scientific facts and evidence that actually green clay for the face works. The opinions are divided and there is a lot of controversy. For example, some state that it is capable of absorbing all the pathogens and impurities from the skin, thanks to the high porosity. Scientists from Russia have discovered that it has a similar effect with radioactive particles, it is sure to be given to people who have been exposed to radiation. Proponents of other theories claim that green clay actually has a "mind of its own" and finds all foreign objects in the body, and successfully eliminates them. The third claim is that it detects and draws all viruses, bacteria and toxins (positive particles) due to its extremely negative charge and thus attacks diseases. Without going into what is correct and accurate, one is certain, and that is that green clay for the face achieves remarkable results. Potatoes and green clay, absorb any excess fat and impurities from the skin, but also bleach freckles and dark spots on the skin. Grate one medium potato, then squeeze the juice and mix it with two tablespoons of clay for outdoor use. Mix until you get a fine paste. Apply the mask on previously cleaned face and leave it until it is completely dry. Wash off the mask with cool water, with gentle, circular motions, and then gently wipe your face with a towel and apply the appropriate cream for oily skin. Repeat once or twice a week. Before each application it is necessary to do a thorough exfoliation to remove the layer of dead skin and allow better operation of the mask. Mix a tablespoon of green clay with a tablespoon of honey and a teaspoon of yogurt, then add a little mineral water until you get a fine compact paste. Apply the resulting mask to cleaned face and leave on for twenty minutes, then rinse thoroughly with lukewarm, and later with cold water. Green Clay Mask should be used twice a week, preferably after a thorough scrub. Whisk with a fork one yolk with 30 drops of essential oil of chamomile (drop by drop). Then, add green clay (small wooden scoop) and mix until you get a uniform mixture. Apply the mask in a thin layer to cleansed face and leave on for about 30 minutes, then rinse thoroughly with lukewarm water. The Clay Mask is ideal for sensitive skin, prone to cracking, flaking and inflammation. The yolk will further nourish the skin, and chamomile oil will have anti-inflammatory and soothing effect. Mix a tablespoon of white clay with a teaspoon of yogurt, a teaspoon of white radish juice and a teaspoon of lemon juice. Apply only on dark spots using a cotton swab and let it work for 3-5 minutes, then rinse with lukewarm water. Repeat every other day, before bedtime. Avocados are great for the care of dehydrated and mature skin, so everyday application of these masks will nourish the skin and make it smooth and hydrated. A tablespoon of ripe avocado mash with a fork and mix with a spoon of yogurt, then add green clay (1 tablespoon) and 3 drops of essential oil of sandalwood. Mix until you get a fine paste. Apply the mask to cleansed face and leave it on for fifteen minutes, then remove with a damp terry glove, in gentle circular movements. The rest rinse with lukewarm water and leave to dry naturally on the face, and then apply a good quality moisturizer. This mask is applied at least once a month. Although normal skin is the perfect type, this does not mean that it does not require additional treatment. Masks for normal skin should contain substances that will further nourish and hydrate and make it more resilient to external influences. To prepare the following recipe, you can find all the ingredients in your own kitchen. Heat 3 tablespoons of milk a little and mix with 3 tablespoons of clay for outdoor use and a spoon of homemade honey. Mix until a compact mixture. Apply to cleansed face and leave on for about half an hour. Rinse thoroughly with lukewarm water, then apply a moisturizer on your face. Mix half a cup of green clay, a quarter cup of lemon juice and three tablespoons of warm water and a tablespoon of organic honey. Apply the mixture on your thighs, and put wet strips of algae over it and attach the plastic wrap. Leave for 20-30 minutes, then rinse thoroughly. Repeat at least once a week. This package encourages detoxification of the skin and prevents the formation of cellulite. Green clay (2 tablespoons) mix with one tablespoon of flour, buckwheat and spoon of turmeric, then add rose water to make a paste. After fifteen minutes, apply the mask on your feet and hold until completely dry. Green clay removes impurities from the skin and accelerates blood circulation, while turmeric has an antiseptic effect and accelerates the regeneration of the skin on the heels. After the mask, apply lotion to soften the skin on the feet. Mix 10 grams of wild rose leaves, birch leaves, chamomile and sage leaves and grind in an electric mill until you get a powder. The mixture of plants with 2 tablespoons of clay powder cover with distilled water until you get a fine paste. Apply the mask to cleansed face and leave it on for twenty minutes, then rinse first with cold, but lukewarm water which will further gather enlarged pores. People with sensitive skin can also use it. In addition to skin care, green clay toothpaste gives excellent results. It can be used for the preparation of excellent and inexpensive pasta. Mix the two wooden spoons of green clay with three tablespoons of distilled cold water, then add 4 drops of tea tree oil - known for its antibacterial, antiviral and antifungal action, five drops of liquid sweetener for better taste and 13 drops of essential oils of peppermint (for a better smell and taste ). Oil and sweetener should be added drop by drop with constant stirring. Pour the resulting toothpaste of green clay into a glass jar, close it and allow it to stand for 4-8 hours before use so that all the ingredients can combine well. Close the jar well after each use in order for paste not to tighten when it becomes almost unusable. Mix half a bucket of clay for external use, a tablespoon of olive oil and three drops of lavender essential oil. Mix until you get a smooth paste that should be kept in a glass jars. Every night, before bedtime, apply the mask on the cuticles and nails, and after the massage allow it to dry. Then rinse with lukewarm water, apply olive oil and leave it overnight. Cream with green clay is an excellent preparation for this purpose. What are the experiences with green clay? Almost every bigger and better known portal of alternative medicine that deals with phytotherapy, natural cosmetics and the like, has a separate topic on the green clay. User experience with preparations are more than good and positive. In addition that the green clay for the face showed very good results, because it speeds up regeneration of damaged skin, stimulates circulation and better blood circulation in the region, it is also good for the whole skin and is a part of various dermatological preparations. It gives excellent results in problems with haemorrhoids, varicose veins, and rheumatic diseases. The lining of green clay is an excellent tool for coarse elbows and knees, cracked heels, expressed dark circles. It successfully eliminates foot odours, relieves pain after insect bites, as well as painful sores on the skin, wound or burn and when applied several times a day it will considerably accelerate healing. Does the green clay cause side effects and adverse reactions? Generally side effects after consuming of the said products are quite rare and to non-existent. In the event of any ailments report immediately to the infirmary. They should not to be used by people with problems with thyroid gland, kidneys and gallstones, diabetes, heart conditions and suffering from high blood pressure. It is recommended that the green clay is not used while taking another drug therapy, because it could mitigate the effects of drugs. If you are already using green clay and you do not want to interrupt the therapy, make sure that you use it at least 2 hours before the medication. Where to get green clay and what is the price? The green clay for oral use today can be found in all better supplied pharmacies and the price primarily depends on the manufacturer. Better quality product will cost about 5 dollars for a pack of 200 grams (it is assumed that they are also more expensive ones). Preparations of clay can be easily ordered online, but you are advised to first consult and well-inform yourself about everything, before you order. If you need it only for external use then it is something cheaper and the price is around 3 dollars per package. Recipes on how to make a green clay for face acne, pimples, wrinkles as well as many others, are here in this article, but of course nobody prevents you from buying the finished product just for that purpose. It is understood that it is slightly more expensive. Note that applies to all recipes: green clay for face should not be prepared in a metal container nor the ingredients be mixed with a metal spoon, obtain an appropriate plastic or better wooden one. We recommend an excellent article detoxification of body with food and water.